DELE ALLI has revealed his love for pop band One Direction. 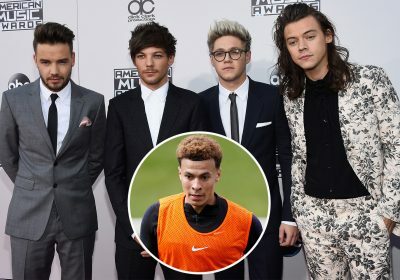 Tottenham and England star Alli says that he enjoys listening to songs by the group comprised of Niall Horan, Liam Payne, Harry Styles, Louis Tomlinson and former member Zayn Malik. Alli, looking slightly coy, told the BBC’s Match of the Day Mix: “[Any guilty pleasures?] One Direction. “I wouldn’t say I’m a fan but there’s a couple of songs that I like. “You’d never hear me playing them in the changing room though. I think they’re good. Alli will be hoping music by the X-Factor’s third-place group from 2010 can inspire Spurs to a Champions League finish this season. A brutal run of results saw Tottenham drop out of the Premier League title race. And they are now competing with Manchester United, Arsenal and Chelsea for one of the final top four spots left in the table. Alli returned from injury for the 2-1 defeat to Southampton earlier this month but is sure to make a valuable contribution to the end-of-season run-in.